THE UNEMPLOYED EATER: I'm Moving East... to West Adams. I'm Moving East... to West Adams. I also have been encumbered by work obligations, but the main hindrance has certainly been the move as first open houses, then bidding, then escrow, then packing, then moving, then unpacking, then deciding wall placements for all my Little League trophies consumed my every waking hour. The good news: it's pretty much over and things are beginning to resettle to the norm. The (maybe) bad news for some of you: I moved... EAST. Now, before you stab me with your butter knives, rest assured: I moved east... by seven minutes. Yes, I am now seven minutes east of my Culver City location in West Adams. Or, as I've been describing it to friends, "West West Adams" as I'm a mere few blocks from the Culver border. Nonetheless, according to the LA Times, there's a lot of fun stuff, food included, about to happen here. This is on top of the rich culinary tradition already about. The conclusion to all this is my coverage, hopefully, will be ramping up again and, even though I'm now no longer technically on the westside, UE coverage should remain about the same of all regions of town. In fact, with the more centralized spot, it may be enhanced. Know this as well: I am a westsider at heart and nothing, not even my address, can take that away from me. I want to thank everyone who has read the blog over the years. I don't say it enough: I appreciate your appreciation of my little food musings. I eat three meals a day, so it's fun to share my views with a (mostly) receptive audience. 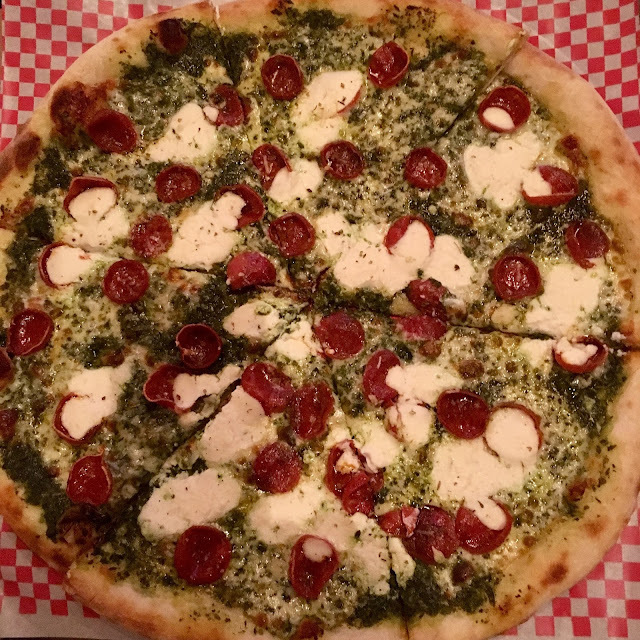 Thus far in WA, I've enjoyed the Pesto Pepperoni pie pictured above from Delicious and many a fresh juice from Vee's. Any other recs? I'm sure you've been, but Revolutionario Tacos? Sounds great, where is it? Dude, west adams is still the west side. I just found your blog, and am loving it. I moved to Far West Adams in 2016, and am super excited about what's happening here. On our visit to this place, we mostly stayed downstairs, where the beer and liquor selection was quite admirable. The staff at event venues here really pride themselves on the beers and food they have.